Posted April 25, 2013 by finnfemme & filed under Beauty, Fashion, Vintage. Yardley of London had most of us American girls in thrall in the late ’60s. Of course we all wanted to look like Twiggy or Jean Shrimpton, you know, mod British models who just happened to be impossibly gorgeous. Not the reality of pimples and gawkiness that most of us faced (OK, maybe it was just me -HA). Yardley of London tried to be cheerfully helpful in offering “Make Me a Model” lessons in Seventeen magazine. This ad from the October, 1968 issue shows how Twiggy does her groovy eye makeup, “in three easy steps“. 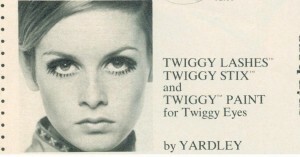 Simply 1) Apply Twiggy Lashes – false eyelashes made of human hair. 2) Apply Twiggy Stix – draw smudgy rainbow lines in the crease of your eye. 3) Apply Twiggy Eye Paint – alternate painting dark and white lines above upper lashes, then painting on little Twiggies between your lower lashes.